In recognition of my birthday today, the city has given me this building. Okay, not really, bit it is my birthday!This is the site of the new Art Center for the University of California, Riverside. I believe this building was the first department store to be located in Riverside. None the less, the inside of this place is beautiful! I can’t wait till it opens. 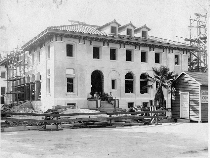 In 1929, the Riverside Young Women’s Christian Association (YWCA) selected the corner of 7th (now Mission Inn Avenue) and Lime Streets as the site for its new building. The association’s directors hired architect Julia Morgan to design the building over the objections of Frank Miller of the Mission Inn, who wanted an architect who would design the building in the Mission Revival Style architecture. In 1960, the Riverside Art Center began fundraising to purchase the YWCA building, which had recently come onto the market. On July 5, 1967, the YWCA officially sold the building to the Riverside Arts Center for $250,000. In 1982, the building was designated a Registered Historic Place and a city historic landmark. In 1992, a three-phase renovation of the building was undertaken with the financial assistance of the City of Riverside.